Following features of Dynamics CRM 2013 I am covering here comparing with Dynamics CRM 2011. 1. Navigation: One of the huge difference between Dynamics CRM 2011 and 2013 is navigation. Page and menu navigation has changed drastically in Dynamics CRM 2013. 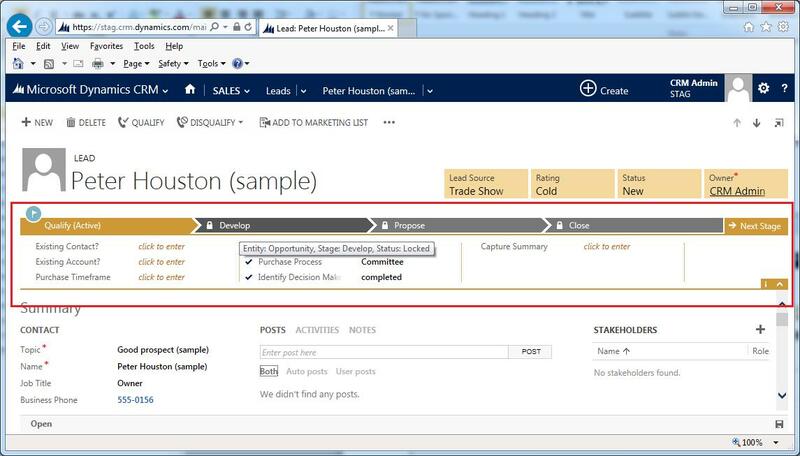 In CRM 2011 navigation is done thru left navigation and ribbon menu, however in CRM 2013 it is very user friendly, no left navigation and no ribbon menu, all you have to do just click on any drop down on left top side to go to corresponding page. 2. Ribbon Menu: Ribbon menu is gone in Dynamics CRM 2013, No more ribbon, instead, you’ll see just the commands related to the things you’re working on. rather than using a ribbon displaying every option to the user, the navigation is streamlined to a few commands. The user can select the ellipses (….) called the MORE COMMANDS button to find relevant commands for the records in context. 3. Auto Save: In Microsoft Dynamics CRM 2013, you no longer need to click or tap Save when you’re editing. It has the ability to save records automatically when you create new record or update existing record. While editing a record, CRM automatically saves the record every 30 seconds and when you close the record or go to other page, it gets automatically saved. By default, the system automatically saves any edited records every 30 seconds, or when you navigate to another record. This feature can also be disabled in the Settings, if anyone is not interested to use. Having an auto-save will significantly reduce clicks for power users who had to save and close ever record in previous versions. 4. Popup windows: Popup window functionality is also gone in Dynamics CRM 2013, as you all know In Dynamics CRM 2011, every link opens new window, sometimes it really frustrates, however in CRM 2013, you will clearly notice the absence of pop-up windows. Just like any website, everything happens inside one window, no more popup windows, when you click on any link navigation it replaces your current view with the new page. Dynamics CRM 2013 has Popup option, if you want particular window to be popup, you can click on Popup command. As shown in the below screenshot, a record opens up right within the same window—NOT a new window or tab. To navigate out of the record, you do not need to close the record, but rather you just select where you want to go on the top navigation. You can also use the back button to go to previous page. 5. Business Process flow: The concept of Business Processes was already introduced in the Rollup 12 of Dynamics CRM 2011, but it was limited to the Opportunity, Lead and Case entities. With the release of CRM 2013, organizations can now create processes for any entity. The business process flow guides users through the various phases of the sales and customer service processes. In addition, multiple processes can be created for the same record type and made available to users through security roles. The method of creating Processes in CRM is just like creating workflows or dialogs in CRM 2011. Now, you’ll see a process bar at the top of the screen for many of the record types. With these new business processes, each stage for working with a customer is clearly outlined. Steps to complete your work are easy to follow. Example below screenshot shows different stages of Lead like Qualify, Develop, Propose and Close. 7. 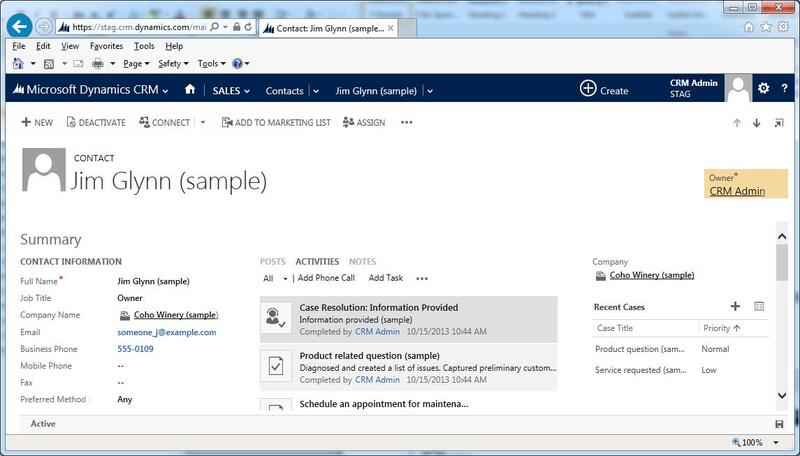 Actions: Actions are a new feature in Microsoft Dynamics CRM 2013. Actions are a type of process that is run by using custom code that uses the Microsoft Dynamics CRM web services. If you are not a developer, or if you haven’t installed some solution that uses actions, you won’t be able to do anything with Actions in Microsoft Dynamics CRM 2013. You cannot call an action from another process except indirectly through a custom workflow activity or plug-in that contains the code to call the action. However, if you install a solution that uses Actions or if you work with a developer who can write code for one, you will see that Actions is a very powerful feature.Actions open a range of possibilities for developers and people who compose business logic. Before Actions, the primary way that developers could implement business processes was limited to plug-ins or custom workflows. 8. Quick Create Forms: Microsoft has introduced new feature in Dynamics CRM 2013, with this you can quickly capture key data points when you enter new records with Quick Create. On the right navigation bar, click or tap Create, and then select the type of record you want. Enter data for a few fields, or more if you have it. You can come back and fill in the gaps later when you have more time. Whenever the user clicks create on the top right of the screen, the form that is displayed is called the Quick Create form. This allows users to fill out a subset of fields needed to create the record. What’s neat about this is that it does not disturb the record you are on. The Quick Create allows you to multitask should you get a phone call or want to make a note while you are working on something else. 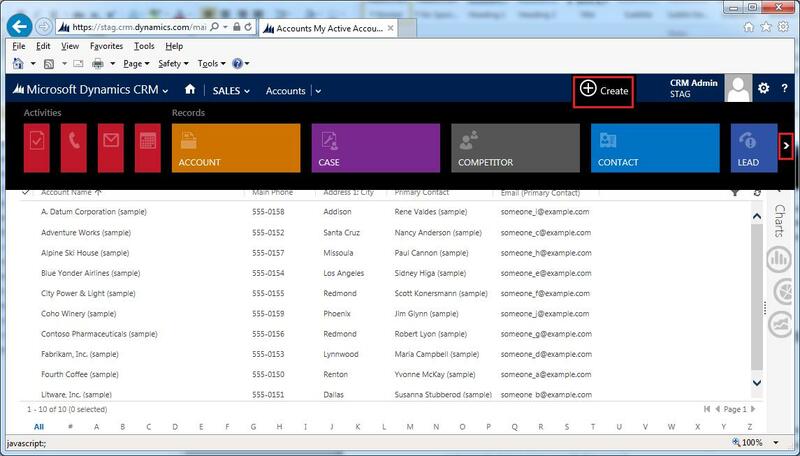 Administrators can modify the Quick Create forms through the customizations area in CRM 2013. Below screenshot shows what type of records I can create quickly. 9. Quick View Forms: These forms allow you to show fields and lists in a form from a record that is related to the current record. For example, if you want to see details for the account record that is linked to an opportunity, you can add a quick view form that exists for the account entity and display the information in the opportunity form. This data can include any fields from the account entity as well as lists showing any records related to the account. 10. Social Pane: It was already partially introduced in Rollup 12 of Dynamics CRM 2011 on the Lead, Opportunity, and Case, In CRM 2013, the social pane has been extended to most other types of records. Also included is the ability to add all types of activities in addition to the Task and Phone Call. It allows you to view and create social posts right on the record. You can see posts automatically generated, such as when the record is created. The social pane also allows the users to create notes and activities in a simplified form—making it much easier for users to see and record what is going on with this record. Using the buttons in the top right of the newly created activity, the user can expand the activity to see all the notes or open the activity to view, edit, or complete it. 11. 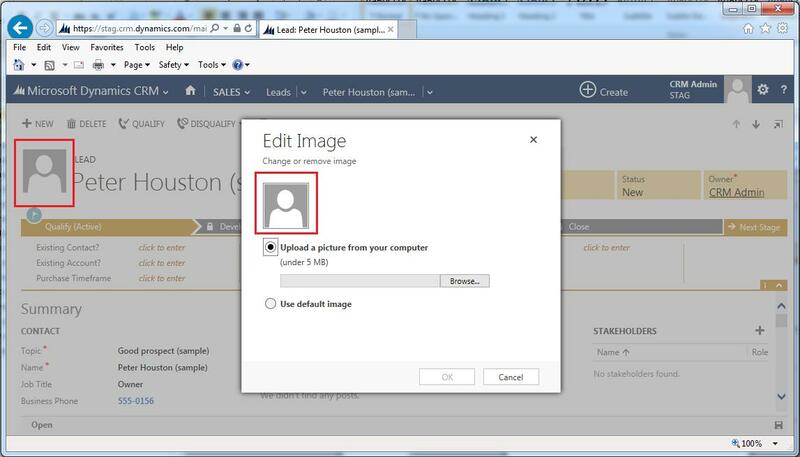 Store Images: In Dynamics CRM 2013, Microsoft has introduced new functionality to associate images on entities. With this you can now store images on custom entities and some of the OOB like User and Contact. Below screenshot shows adding image on Contact, similarly we can do on User too. 12. Multi browser support: It was already introduced in Microsoft Dynamics CRM 2011 Update Rollup 12, however Dynamics CRM 2013 now fully supports browser compatibility for Firefox, Chrome, and Safari latest browsers. 13. Yammer Integration: Microsoft Dynamics CRM 2013 supports integration with Yammer. Using the Enterprise power of Yammer, your team can quickly comment on posts or start contextual conversations from within Microsoft Dynamics CRM(on-premises and online) or Yammer. Users can participate in social conversations directly within Microsoft Dynamics, through the Yammer web and desktop applications as well as apps running on Microsoft (Windows Phone), Apple (iOS) and Google (Android) mobile devices. 14. Skype integration: Microsoft Dynamics CRM 2013 supports Skype integration, we can call or video conference with a CRM contact, prospect, or lead with a single click or tap. The productivity gain per call is small, but even these moments add up to greater efficiency. More importantly, tools like Skype integration enhance the user experience and affinity for using the system. 16. Windows 8 and iPad apps: Microsoft Dynamics CRM 2013 mobile apps for iPad and Windows 8 tablets are available for online CRM. With access to your CRM solution on your Windows 8 tablet or iPad as well as your mobile phone, you have the tools you need to not only look smarter but also to be smarter. Microsoft Dynamics CRM for tablets helps you stay connected and productive wherever you are. Use your iPad or Windows 8 tablet to stay up to date with your customer info —even when you’re on the go. Arrive prepared for every appointment, and update your notes, tasks, contacts, accounts, and leads while the details are still fresh in your mind. Data is cached for offline viewing so you can still access key data if connectivity is lost. 17. Customizable Tooltips: The description text set for fields is now displayed as tooltips when you place your cursor over the labels for fields. Set the description text to provide guidance for people in your organization. This entry was posted in CRM 2013 and tagged CRM 2013, Dynamics CRM, Dynamics CRM 2011, Microsoft Dynamics CRM. Bookmark the permalink.